The Veterans Open House at Evreux Air Base was a huge success and the 125 veterans and their families that made the trip received red carpet treatment by the French Air Force. 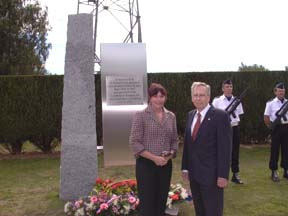 Ruth Grasher and Barbara Howard had the honor of unveiling the memorial. Ruth is the widow of Capt. Howard Grasher who was killed in a 1958 C-130 accident and Barbara is her daughter. Maj. Gen. Jim Pfautz (USAF Ret.) and Maj. Gen. Chuck Wilson (USAF Ret. 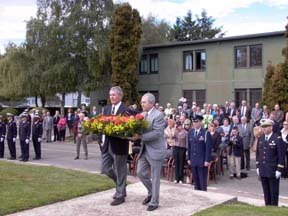 ), representing the American veterans of the base, placed the first wreath at the memorial. Major Ryan Pendleton USAF, Assistant Air Attaché, US Embassy Paris, representing the US Air Force then placed a wreath followed by Col. Pascal Valentin, representing the French Air Force at Evreux Air Base. 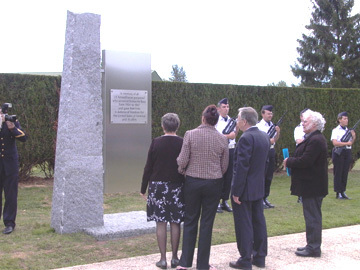 Bill Lloyd read the 43 names of the airmen and soldiers that were being honored with this memorial followed by the French and American Taps and a final salute by the French Air Force Honor Guard. It was an emotional ceremony for all those present. The Marguerite #1 Hanger was converted to a huge exposition depicting the history of the air base. The exposition was divided into separate areas representing the different eras of the base history. The early days of French aviation with antique aircraft from that period were at the entrance and then displays for the pre WWII time frame; the WWII German Air Force; the US Air Force and the French Air Force. Each area had a mini theater with an aviation oriented slide show or movie running of that particular time frame. Outside the hanger was a C-160 from the base along with additional base displays. Also at the exposition was a Normandy organization that recovers aircraft throughout France that crashed during WWII. They had a large display of some of the recovered aircraft artifacts. Two weeks prior to the exposition they had located a Lancaster aircraft with 14 - 500 pound bombs still on it. Bill Lloyd cut the ribbon to the USAF section of the exposition, which had numerous pictures and memorabilia of the 465th TCW and the 317th TCW at the base. An original base housing trailer, a C-45 aircraft and even an early 60’s Corvette were on display. There were mannequins in uniforms that had been donated by the veterans that were so realistic they looked ready for inspection. The banquet and floorshow in the old “O” Club brought back many memories for the veterans: a night at the club with a great meal followed by great entertainment. There were Edith Piaf renditions along with song and dance routines that were typical of the shows of long ago. Mr. Jean Louis Debre, the Mayor of Evreux, hosted a reception in City Hall. He welcomed all the veterans back to Evreux and shook their hands and posed for pictures as they signed the City Hall Guest Book. The veterans were very appreciative that he took time from his 2 jobs as Mayor of Evreux and President of the French Parliament to spend several hours with them. Bill Lloyd presented him with an award in appreciation of the warm welcome and the enduring friendship the city had extended to the veterans all weekend. Some of the other events included a visit to the City Art Gallery for a special exhibit of aviation art, a tour of the off base housing areas, a tour of the air base, Sunday morning Mass in the Base Chapel and a tour of the Caen Peace Memorial and Museum. At the luncheon with Col. Valentin and his staff, Col. Valentin presented Ruth Grasher, Major Pendleton and Bill Lloyd with exact replicas of the monument. Jean Zabukovec made these replicas from the same block of granite as the monument. The weekend concluded with a reception at Jeff Lambert’s historic chateau where he and Patrice LeMao gave a tour of the grounds. The entire 3 days will be remembered as one high point after another and one of great friendship between the veterans and everybody they came in contact with on the base and off the base. Thanks go out to Col. Valentin, Capt. Delahaye and the entire group of base personnel that worked so hard to make the exposition and the weekend the huge success that it was. Also to Patrice LeMao who was the coordinator of the Open House along with Jeff Lambert, Jean Zabukovec and Eliane Montouchet. It was a great team effort that took months of planning and hard work. The veterans and their families will never forget their visit to their old home and the great friendship that exists between the past and present airmen of Evreux Air Base.